Wah! It’s enough to strike fear into any parent, even an avid crafter like me. Why? Well firstly there’s a time constraint – any craft project I undertake these days takes at least three times longer than it’s supposed to. Secondly it needs to be something G can help me with – no getting carried away looking at ridiculously extravagant bonnet ideas on Pinterest, and definitely no sewing or crochet allowed. And thirdly, other parents will be watching! Can I stick to number 2 without losing my crafty credentials?! No offence to my incredibly creative daughter, but she is only 4 after all, and her attention span is not exactly infinite. When asked, G insisted she wanted pretty much everything on her bonnet, but we compromised on flowers and butterflies, as long as there was some pink and glitter in there. 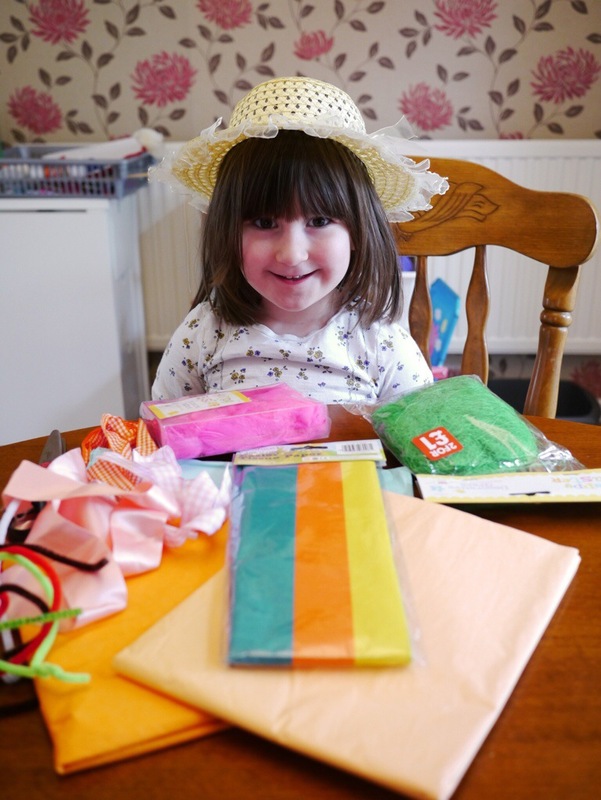 A quick trip to the pound shop gave us some basic materials – a plain bonnet (a little on the small side but nothing a bit of ribbon wouldn’t help with), some crepe paper in Easter colours and fake grass. We already had at home some pipe cleaners, green card, glitter and some sticky foam butterflies. 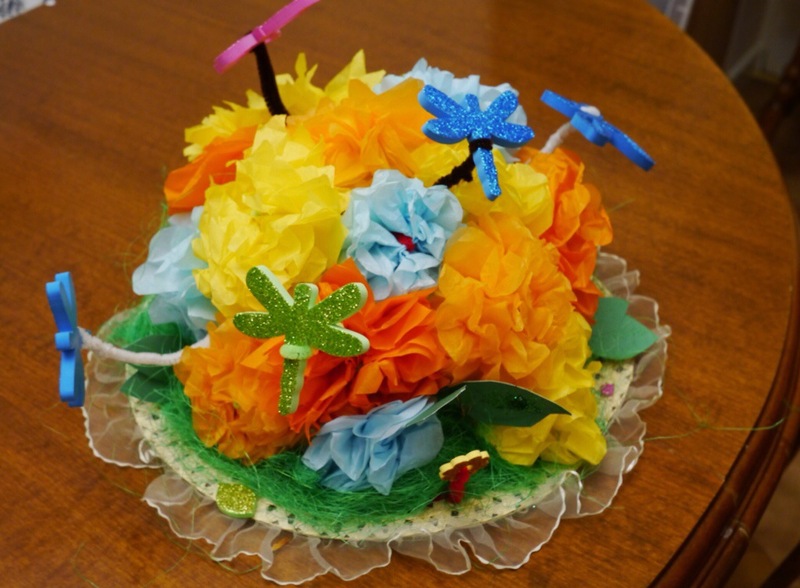 We started by making the flowers. 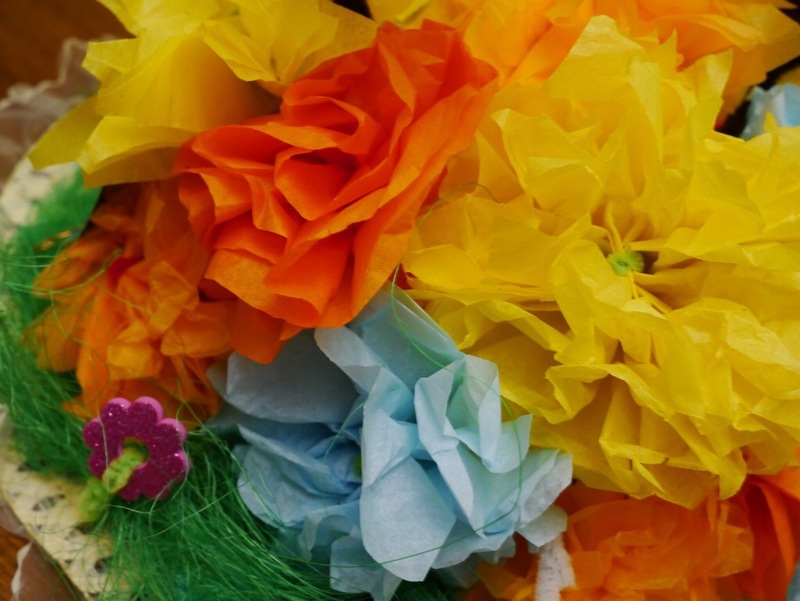 To do this you need about 3-5 layers of crepe paper, measuring around about 4″ wide and 12″ long and laid on top of each other. We varied the size of our rectangles to make different sized flowers. Starting with the short side, fold the paper in a concertina style, with the folds about half an inch wide – don’t make the folds any wider or it’ll be hard to open up the flower later. Secure in the middle with a pipe cleaner and then trim the ends into either a rounded or pointed shape. 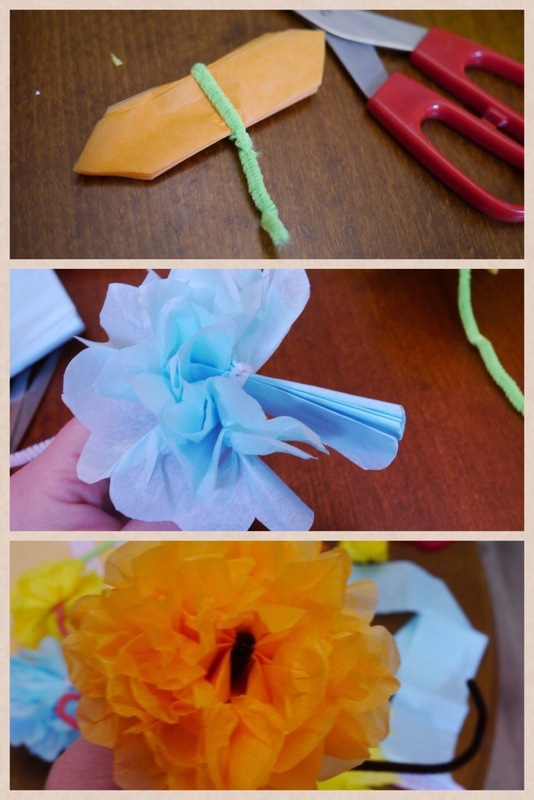 To turn these into flowers you first fan out your paper on either side of the pipe cleaner and them very carefully separate the layers from each other and fluff up into a flower shape. 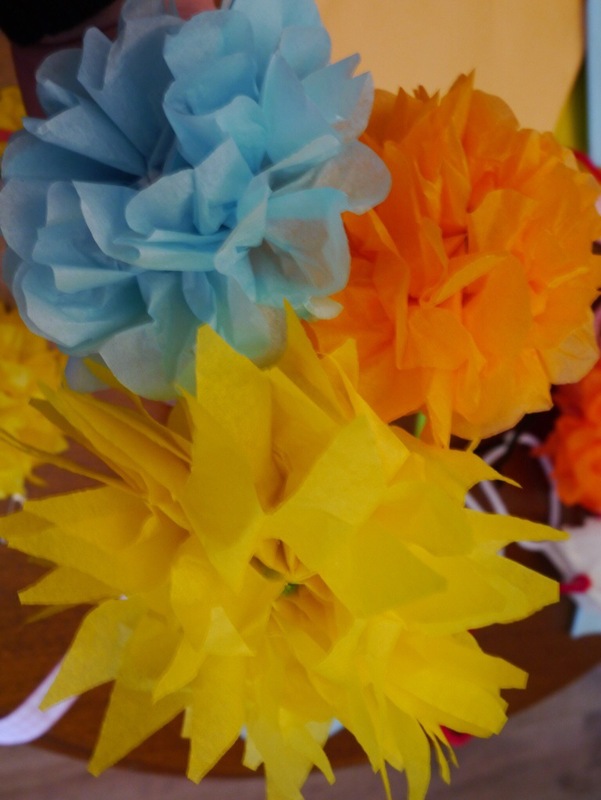 We made about 15 flowers in a variety of colours and sizes. This is by far the most time consuming bit (I never said it was a quick project! ), and I have to confess G got bored halfway through and left me to finish the flowers on my own. Next you need to attach your flowers to the bonnet. 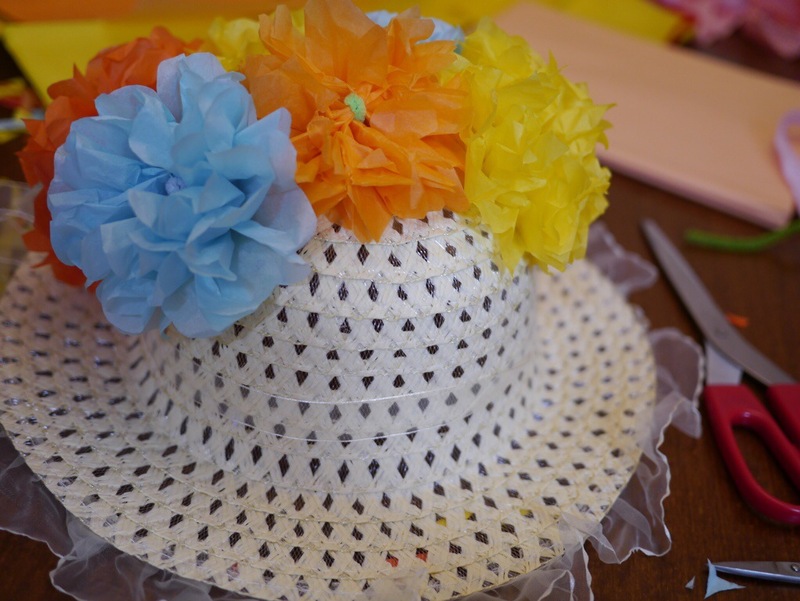 Staring at the top, use a small pair of scissors to cut a little hole in the hat which you can then poke the pipe cleaner stems through. 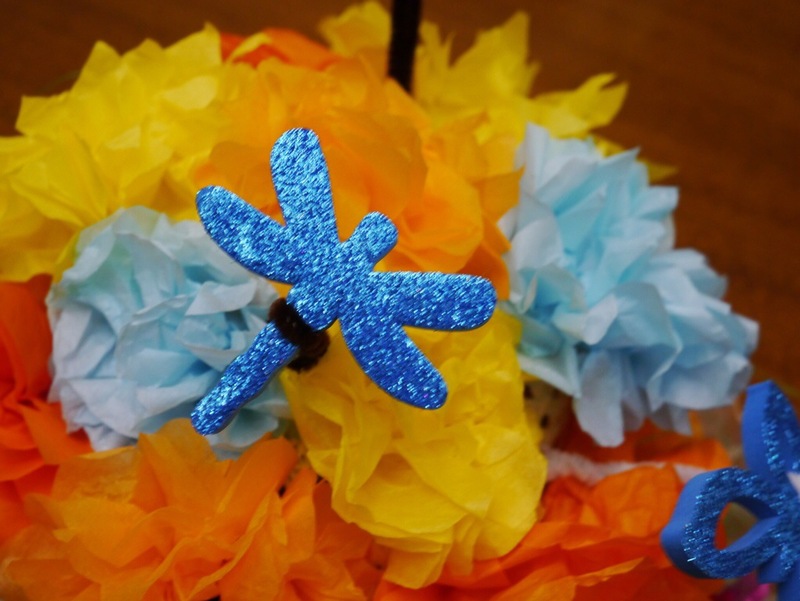 Do the same for a second flower next to your first, then turn the hat over to secure the two pipe cleaners to each other, holding the flowers in place. Continue until you’ve covered the whole top of the hat. Take the fake grass and tease it out into a strip. This then wraps around the brim of the hat, tucking underneath the flowers. We added some little foam flowers we had around the side to secure the grass in place. Next the leaves. Using green card, draw and cut out your leaf shapes. Then cover them with glue (both sides) and sprinkle with glitter. Take 2-3 leaves at a time, poke a hole in the bottom and attach to the hat with pipe cleaners. Pipe cleaners again for our sticky foam butterflies and dragonflies. We fixed them so they were flying above the flowers and would move a little as she walked. If you don’t have sticky foam ones like us (or wanted some slightly classier ones!) you could make them out of card and colour them in, or even use felt to cut them out of. Last but not least, we attached some ribbon to either side of the hat for it to be tied onto G’s head neatly with a bow. You’ll have to wait until next week to see the bonnet in action at the Easter parade. In the meantime I’d love to see your creations or Easter bonnet plans! G is learning Jolly Phonics at school. She loves it, but is most put out that they’re only learning a few phonemes at a time. So she’s decided to teach herself some more. 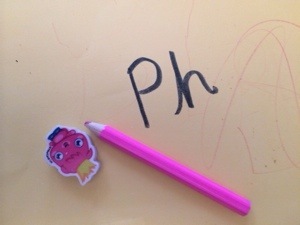 Today’s choice was a bit ambitious – ‘ph’, as in ‘phone’. So I helped her sound it out and made up a silly song about it, as you do, then headed off to school. What I hadn’t reckoned on was her eagerness to share her knowledge with everyone we passed en route to the school gates. “Ph ph ph” she shouted gleefully at the top of her voice. Except if you sound it out yourself you can imagine what everyone else was hearing. “For phone!” I hastily added, roughly in the direction of every mum I saw. “Make sure you say ‘for phone’ when you tell the teacher what you’ve learnt” I impressed upon her at the nursery door. Just do, ok. Just do. G is at school in the afternoons only this year, and with school drop off at 1230 it doesn’t really leave much time for going anywhere in the mornings. C is not really in much of a routine yet, so it’s a case of grabbing time when I can to spend with G.
Last week we had one day (yep, one!) which played out perfectly. After getting both kids up, dressed and fed, C decided it was time for a long nap, so G and I made the most of it. We had a picnic with her dolls and dogs, a pretend sleepover in her bedroom (I even had to get the camp bed out, though I was allowed to have her bed), and had about three run throughs of her new favourite book – a ‘Biff, Chip and Kipper’ one about a swimming lesson. All whilst C snored contentedly away downstairs. 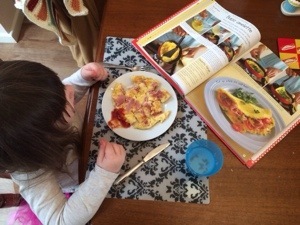 G loves baking, so taking a chance that C would stay asleep, we decided to break open her ‘I Can Cook’ kids cookbook and make something for lunch which ordinarily she’d turn her nose up at – a cheese and ham omelette. She loved following the picture instructions, whisking the eggs, ripping up the ham with her hands and mixing it all up. And more importantly, she gobbled the lot up too. Now G’s always had a healthy appetite, but she can get quite fussy beyond her staple favourites where cheese sandwiches outrank all others (except perhaps Yorkshire puddings). So for that plus keeping her happily entertained for a good hour overall, we’ll definitely be doing this again. Next time I’ll make sure we’ve got enough ingredients for me too! And in case you’re wondering, yes, that is a dollop of mummy’s homemade tomato ketchup on the side.